Jelsa, it seems, can throw a really good party. Last night’s festival of wine and Jazz was a fine evening’s entertainment in a lovely setting. The entire waterfront was sparkling as we arrived shortly after the 8pm start. We strolled around, looking to see what was where, enjoying the wafting smells of food being prepared and the occasional folk troupe. 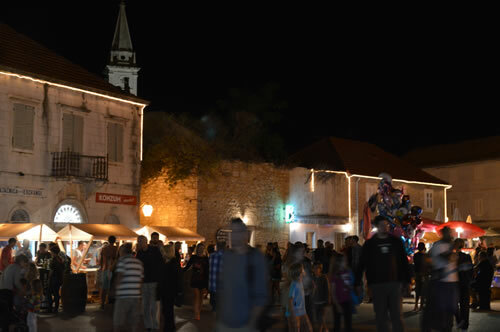 Next to the open air stage, the Hvar Winemakers Association were set up in strategic position, getting a lot of interest from the growing crowd. Four of the most local wineries were grouped here: PZ Svirče, Tomić, Carić, and Duboković. We bought our tasting coupons, collected our official glasses and looked to see what new wines were on offer. To be honest, many of the details of our merry evening now fail me, but I remember we started with the rather excellent Pošip de luxe from PZ Svirče. It was a new one on me, and certainly one I’ll be looking for again. Tomić’s Sv Klement, is a pošip from vineyards on the Pakleni islands, giving it a distinctively different character. This is a wine that seems to grow better with every year. Carić’s Cesarica is a pošip/bogdanjuša blend, and turning into one of our favourite whites from the island. From the Duboković table, we tried Moj otok, a fine blend of maraština, parč, kuć and bogdanjuša. Not heard of any of those before? They’re local Hvar white varietals, and the combination is gently evocative of this very aromatic island. 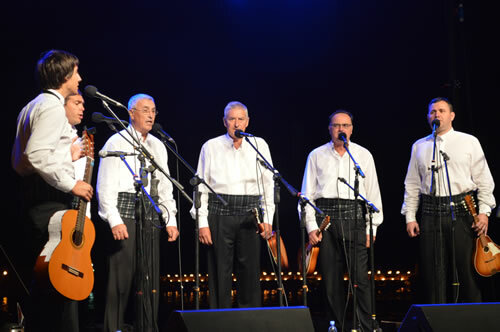 Round the back of the stage, the klapa group was warming up in soft voices. A shout went up – bakljada! – torches! 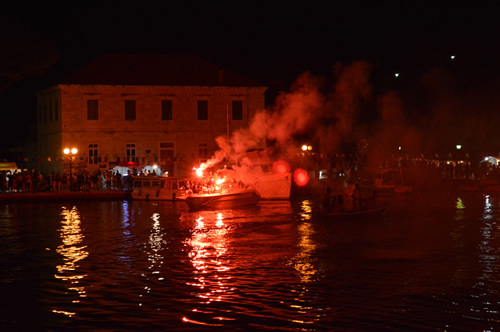 We all surged over to the water’s edge as a parade of small boats approached out of the darkness, waving red flares. Behind them, the harbour wall was double-lined with white torches – all very magical and pretty. 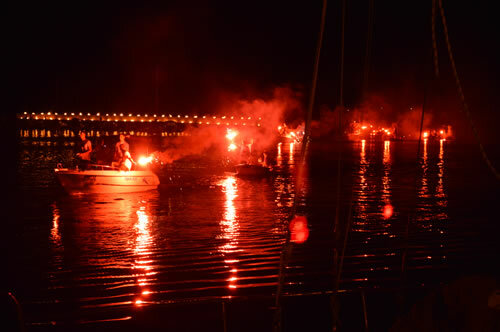 The smoking red torches on the boats created lots of smoke, and as flares were thrown into the water the whole thing looked much like a small-scale re-enactment of the battle of Trafalgar, but without the booming cannons! Re-enactment of a naval battle against Jelsa town hall! One of the prime attractions of the evening for us was the klapa singing. 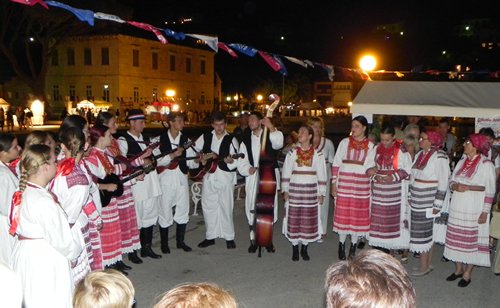 Our local group from Vrboska, Klapa Kaštilac, are really getting remarkably good, and have been expanding their repetoire. 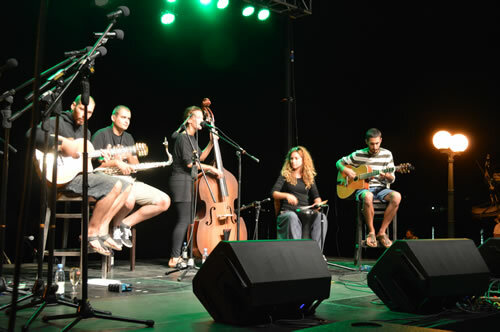 What a great performance – well done, guys! I could have happily listened to them for much longer, but up next was the gypsy jazz band, who also turned out to be rather good. We collected some plates of food and moved on to the red wines. In the midst of all this was an artist using his wine to paint with. Different. He called it vinorel – as opposed to aquarel I suppose! 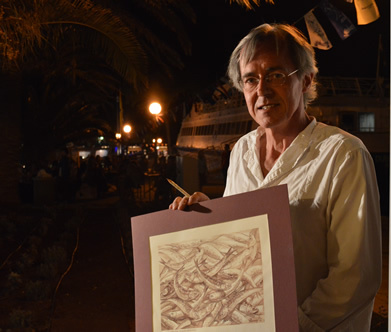 We chatted for a while, and I’ll tell you more about Dražen Pačalat and his artwork in a separate blog. I was rather impressed with the idea of painting with wine! We finished up our wine tasting with a couple of glasses of prošek – both excellent examples of this very traditional Dalmatian dessert wine – Tomić’s Hektorović, and Duboković’s Prvi poljubac, or First Kiss, which as Ivo Duboković explained is his white prošek. One of these days I really want to revisit his red wine version, Don Petar. Also at the event were our friends from Plančić winery, with a double stand featuring other local produce including some very fine Pag cheeses. The best of which was Sirana Gligora’s Žigljen, which has actually won a “best cheese in the world” award. The cheese went particularly well with the glass of Grand Cru to round off our evening’s tastings. By now it was getting on for 2am, and the jazz had long been replaced by something more upbeat for the trendy younger crowd. Time to go. Tomorrow’s festivities in the same place include donkey races and climbing the greasy pole. Can’t wait! ← What can you make from Hvar’s natural resources?